Automated Bagging Systems | High Performance | ROBOVIC Inc.
Robovic is an integrator of Statec Binder bagging systems. We work in conjunction with our partner who is internationally known in the field of bagging. Robovic is first responder at all times for Statec Binder systems. We can provide an evaluation and complete analysis of your needs in order to offer a perfectly integrated system, from bagging to palletizing. The bagging systems are complete solutions: high performance, entirely automated and designed to handle a multitude of products. The system distinguishes itself by its high production capacity, its low energy consumption, precise weighing system and the efficiency of picking up and opening paper, plastic or poly woven bags. The bagging systems are designed to bag products of different formats. The variety of our equipment for the bagging systems enables any speed to be adapted from very high to low. Production speed of the bagging machines can reach up to 2400 bags/hr. The characteristics of our machines adjust to quick and easy bag type and production changes, thus reducing down time on the production line and making the system multi-purpose. These solutions are optimized to fill 10-80 kg bags. Statec Binder has installed systems in multiple activity sectors for years. 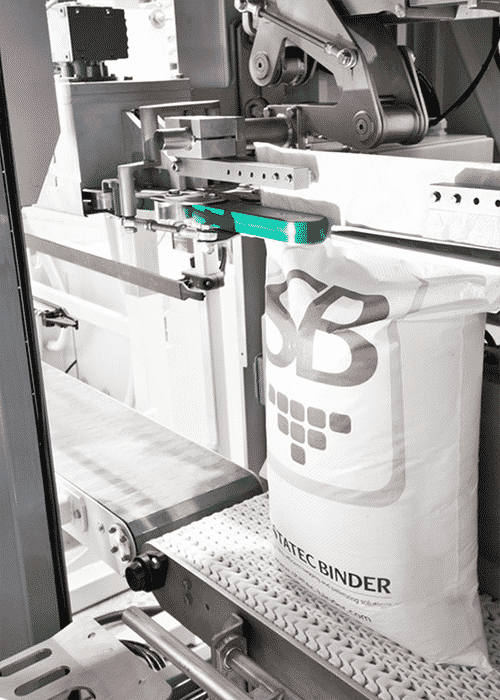 Our expertise in the bag handling field combined with Statec Binder’s knowledge ensures well thought out solutions, efficient and adapted to individual needs.